Soft brown Trachten cardigan in walked wool. This cardigan’s traditional cut lends it a straight form. Subtle shoulder pads complement the cut wonderfully and ensure a great fit. Metal, old-silver-look Trachten buttons are decorated with the label’s name and join together with borders in a contrasting colour and a different stitch to round off this design in style. The fabric is robust, durable and particularly nice to look at. Lined sleeves give the wearer even more comfort of wear and will keep you feeling soft and cosy. 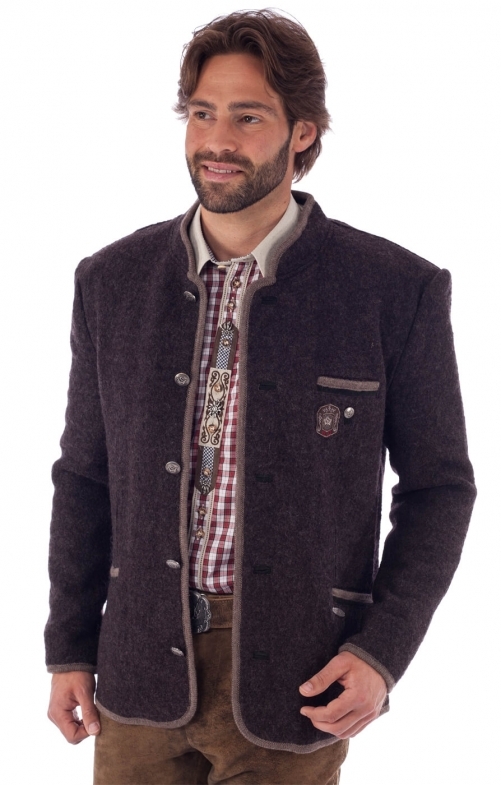 With its classic colour palette, this Orbis Trachten cardigan is a real all-rounder and looks great whatever you wear, be it traditional lederhosen or casual jeans. Eine schöne Jacke für jeden Anlass, gute Passform, tolle Qualität. Da stimmt das Preis- Leistungsverhältnis. Entspricht den Erwartung voll und ganz. Habe Jacke nicht gekauft, weil andere Farbe besser gefallen hat. Rückgabe ohne Probleme.